Do you need to know what guinea pig safe foods there are out there? What vegetables can guinea pigs eat? Guinea pigs make wonderful family pets. Once they’re tame, they are easy to handle and can even be trained to perform simple tricks! A key aspect to good guinea pig health is a correct, balanced diet. In this article, we’ll look at what are guinea pig safe foods. What do wild guinea pigs eat? Wild guinea pigs are exclusively herbivorous. They eat hay, leaves, grass, flowers, and fruit, depending on where they live. Do not feed your guinea pigs meat or dairy products – these are not part of their natural diet and could make your pet sick! What nutrients do guinea pigs need to stay healthy? So what do guinea pigs eat? Guinea pigs’ nutritional requirements are pretty simple. Piggies need 24/7 access to clean, fresh water. A drinking bottle that can be attached to your pet’s cage is a good idea, as water in a dish on the cage floor can be trodden in and soiled, potentially leaving your pet thirsty! Guinea pigs need a good supply of nice quality grass hay to keep their digestion ticking. Also, and crucially, guinea pigs need a daily dose of vitamin C. Vitamin C is essential to prevent a condition called scurvy, which can be dangerous to your pet. Guineas can’t produce their own vitamin C, so you will need to provide it for them. 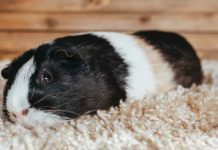 Guinea pig pellets are specially formulated with added vitamin C.
There are also some natural foods that you can feed your piggies to supplement their vitamin C intake, and we’ll talk about these later in this article. What kind of hay is best for guinea pigs? When your guinea pig is a baby (a pup), you should feed him alfalfa hay, because it contains higher levels of calcium than other kinds of hay, and this is important to promote healthy bone growth. When your guinea pig is full-grown, you should feed him timothy hay, which has a lower calcium content and plenty of fiber. Feeding too much calcium can cause health problems such as bladder stones. Your guinea pig’s diet should consist mainly of hay. Guinea pig hay keeps the guinea pig’s digestion working properly and helps to wear down his teeth, preventing them from becoming overgrown. If your guinea pig’s diet contains high levels of oxalate acid and calcium, he could develop bladder stones. Oxalate acid binds to the calcium to create the stones. Bladder stones are very painful for your pet. Be sure to feed guinea pig safe foods that contain oxalate acid and calcium in moderation, to reduce the risk of bladder stones. Guinea pigs can be prone to diarrhea. Diarrhea causes dehydration, which can be fatal in severe cases or where the problem is prolonged. Be sure not to overfeed your guinea pig with veggies and fruit, which could lead to tummy upsets and diarrhea. What are other guinea pig safe foods? Guinea pigs also enjoy the addition of some veggies and fruits to their diet. These tasty treats help to vary the guinea pig’s diet and are important as enrichment tools for your pet’s environment. Check out our lists of veggies and fruits are that guinea pig safe foods! Be sure to click on the links to read the full low-down on feeding these guinea pig veggies and other foods to your pet! Asparagus is a green vegetable that you can feed to your pet occasionally. It contains phosphorus, oxalates, and vitamin C.
It also contains lots of vitamin A, and should only be fed to your pet occasionally. Can guinea pigs eat cabbage? Cabbage is a good source of natural vitamin C for your guinea pig. However, be careful not to feed too much of it, as it can cause bloating and gas. Carrots are one of the most popular guinea pig safe foods. Beware of over-feeding your pet with carrots, as they contain a lot of sugar, which can cause diabetes, obesity, and tooth decay! They are also high in vitamin A. Carrots should be fed occasionally as a special treat for your pet. Can guinea pigs eat cauliflower? Cauliflower (all parts of the vegetable) can be given to guinea pigs and is a good source of vitamin C.
Don’t overdo it though, as cauliflower can cause gas. Celery can be fed to guinea pigs, and it is a good source of vitamin C.
However, you should be aware that celery can be stringy, possibly presenting a choking hazard. Cut it up for your precious pets! Can guinea pigs eat courgettes? Courgettes have plenty of vitamin C and can be given to your guinea pig in small amounts. Can guinea pigs eat corn on the cob and corn husks? Both these corn by-products contain vitamin C.
Corn and its derivatives also contain lots of starch and therefore shouldn’t be fed to your pet too frequently, as they can cause weight gain. Can guinea pigs eat cucumber? Guinea pigs love fresh cucumber! It’s a good source of water and all parts of the vegetable can be fed safely to your guinea pig. Green beans can be fed to your guinea pig in their raw state. Don’t overdo it though, as green beans contain calcium, phosphorus, and vitamin C.
Kale is a member of the brassica plant family, along with cabbage and broccoli. Kale is full of minerals and vitamins, including vitamin C, vitamin K, and vitamin A. This guinea pig safe food is also a great source of fiber, contains no fat and very little sugar. Although your piggies can be fed kale, it’s a good idea to feed in moderation, because overindulgence can cause gas and bloating. Lettuce has no notable nutritional content and can safely be fed as a tasty salad vegetable for your guinea pigs. Although regular, raw grocery store mushrooms won’t harm your guinea pig, they contain very little nutritional content. In fact, it’s likely that your piggies won’t find mushrooms very appealing, especially if there’s something else on offer such as carrots or grapes! Peas have lots of vitamin C and they also contain calcium and phosphorus. Peas are guinea pig safe foods, but they should be fed in moderation – maybe only once a week. Parsnips are tasty root vegetables that can be fed frequently to your guinea pig. These vegetables for guinea pigs are useful for wearing down piggies’ front teeth, as well as providing entertainment and relieving cage boredom. Spinach is a leafy green vegetable that can be fed to guinea pigs. However, feed it sparingly, as it can cause bladder stones if mixed with a calcium-rich diet, due to its high oxalate levels. Guinea pigs can eat grapes as frequent treats. However, as with all fruits, beware that grapes contain lots of sugar, and your piggy could get too fat if he overdoes it! Dandelions are a wild plant that’s actually regarded by gardeners as a weed! Guinea pigs love dandelions and can be fed them regularly. Always wash dandelions thoroughly before feeding them to your pets, and don’t pick them from roadside verges where there may be pesticides and pollutants. 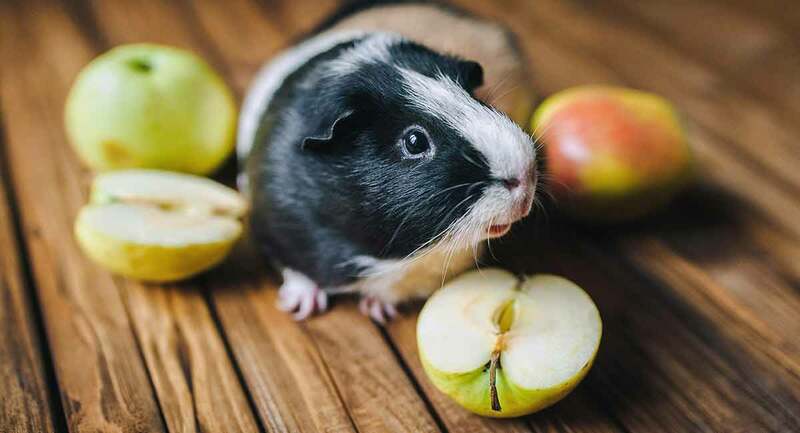 Apples are a safe food for guinea pigs, but only in moderation. Apples have a high sugar content, making them potentially very fattening. Also, be sure to remove the apple pips prior to feeding them, as these can be toxic to your pet if they are eaten in any great quantity. Can guinea pigs eat beetroot? Your guinea pig may enjoy some raw beetroot occasionally. This crunchy root veggie contains vitamin C, calcium, and phosphorus. Be sure to only feed your pet the raw variety of beetroot, not tinned or bottled beets that contain pickling liquor! Can guinea pigs eat raspberries? Guinea pigs can enjoy raspberries, but in moderation, as these little treats are full of sugar! 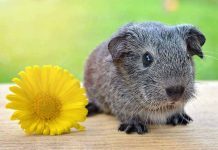 Although guinea pigs do love to eat juicy fresh grass, you should never feed them grass clippings from your lawnmower, as these can cause serious digestive problems. Grass begins to ferment as soon as it has been cut and should therefore not be fed to pets. If you have a garden with a lawn, you could invest in a run for your piggies. They’ll love the fresh air and the freedom to forage among the grass. Watermelon is a delicious sweet treat that your guinea pig will love! Watermelon contains lots of vitamin C, just like other fruits. It’s also naturally full of water and sugar. Too much sugar can make your guinea pig fat and can also cause tooth decay, so always feed just one small slice of watermelon each week. Yes, they can eat bananas, but not very often. Bananas have a high sugar content, and may cause constipation. Limit their access to this sweet food, but if they love it, a little bit now and then is fine. Guinea pigs do like tomatoes, including the seeds. However, do NOT feed them the stalks, vines, or leaves. These are poisonous to guinea pigs. Guinea pigs often love strawberries, and look funny eating them with the red juice. It’s okay to give them a small amount now and then. Just remember that guinea pigs are small animals, and really don’t need much. A slice of strawberry is enough for a week or so! Guinea pigs can eat oranges and their peel. This fruit can be good for them because of its vitamin C content. But too much vitamin C can cause problems, and oranges have a lot of sugar! Limit this treat to small pieces, 1-2 times a week. As with many high-sugar fruits, guinea pigs can have blueberries in moderation. Blueberries have a good amount of vitamin C, so they make a good treat. Again, don’t feed them these berries more than once or twice a week. Your guinea pigs may not love pineapple because of its acidity and strong taste and smell. It’s high-sugar as well, and only safe for them to eat in small quantities. Pineapple has high vitamin C content, which is good for guinea pigs. 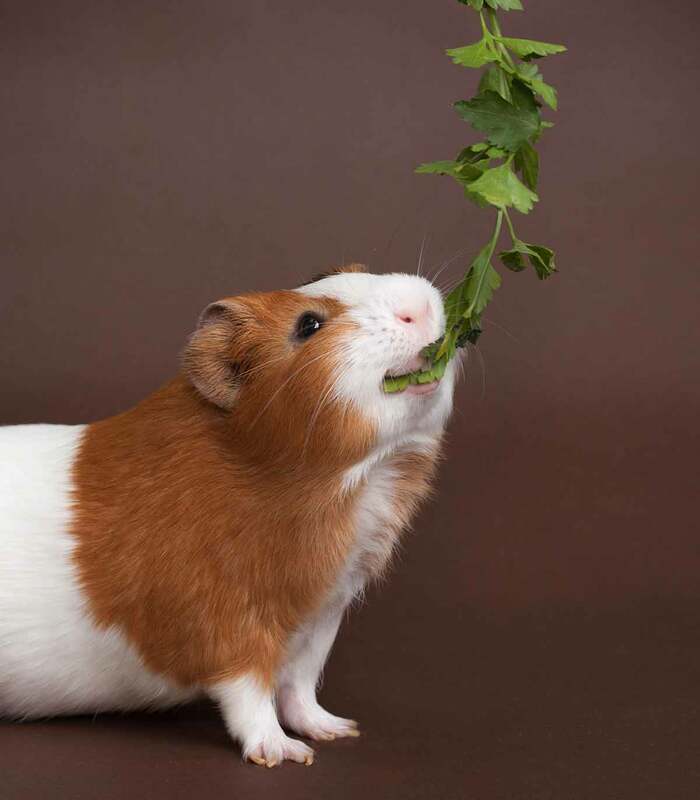 As a nutritious, leafy green herb, parsley is good for guinea pigs in some ways. It has vitamin C and lots of antioxidants. But it has an overly high calcium content too, which isn’t so good for guinea pigs. We suggest limiting parsley to a few times a week. Guinea pigs can eat fresh peas, which are high in vitamin C and vitamin A. But, avoid cooked peas, canned peas, and split peas. One or two peas a few times a week is sufficient for the health of your piggie. Pumpkins can occasionally eat raw pumpkin, which is high in vitamin A. But avoid any seeds, which are a choking hazard for your little pets. But radishes are too high in calcium, phosphorus, acids, and sugar. So they should probably not have radishes too often. Cantaloupes are high in vitamin C and have a good calcium content. So yes, your guinea pig can have a little bit – remember, fruits high in sugar must be eaten in moderation! But avoid giving your pig any of the cantaloupe rind. Can guinea pigs eat mango? Like many fruits, mangoes are too high in sugar. But if your guinea pig loves mango, a little bit once a week won’t hurt them. Plus, they have a lot of vitamin C, which is always good. Can guinea pigs eat brussel sprouts? As a form of wild cabbage with a high vitamin C content, you can feed raw brussels sprouts to guinea pigs. But, be cautious! Brussels sprouts in large amounts can cause gastric bloat, which is fatal. So keep the amounts small. And never cook any of your guinea pig’s foods. Let’s start by asking – can guinea pigs eat potatoes? While potatoes are always dangerous for guinea pigs due to the fact that they’ve evolved an alkaloid that’s poisonous to many mammals, that’s not the case for sweet potatoes. These nutrient-rich tubers contain vitamin C, but they do have a little too much starch, and too many oxalates for daily digestion. So feed raw sweet potatoes to your guinea pigs in moderation – a tiny cube every few weeks is sufficient. Leaves are fine as well. Can guinea pigs eat yams? Yes! You can feed your guinea pigs yams more often than sweet potatoes, believe it or not. Yams are too high in potassium, but also in vitamin C, so a little bit every few days is fine. What are foods guinea pigs can eat? There are lots of yummy treats that your guinea pigs can enjoy! We hope this guinea pig fruit and veg list has been helpful! However, remember to give tasty fruit and veggie treats your piggies in moderation, as too much of a good thing can be harmful to them. Too much fruit can make your guinea pigs fat, could cause dental decay, and might give your pet diarrhea. Many guinea pig safe foods contain oxalate acid and calcium, which can cause bladder stones to form if fed to excess. The bottom line is; your guinea pigs need a balanced diet that includes plenty of timothy hay, fresh water, and guinea pig pellets with added vitamin C in order to keep them healthy and content. What’s your guinea pig’s favorite treat? Why not tell us in the comments section below! Schertel, E.R. et al (2016). 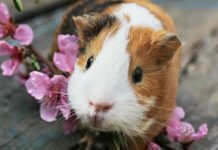 Guinea pig history and care recommendations. MedVet. Quesenberry, K.E. et al (2018). Introduction to guinea pigs. Merck Veterinary Manual, 2018. Sawnee Animal Clinic, Scurvy in Guinea Pigs. Wang, S. et al (2005). Effects of steroidal glycoalkaloids from potatoes (Solanum tuberosum) on in vitro bovine embryo development. Animal Reproduction Science, 85. National Research Council (1995). Nutrient Requirements of Laboratory Animals,: Fourth Revised Edition, 1995. Washington, DC: The National Academies Press. Thank you for the wonderful article! I love how you broke down all the different types of fruits and veggies!! I also learned something for myself. I am prone to kidney stones and my doctor has me one a diet of low Oxalate foods and nonone even him could tell me why! So thank you again!! Now I will try different foods for my gpig to find his favorite! Mine LOVES carrots but thanks to your article above she won’t be getting as much as she has been getting.